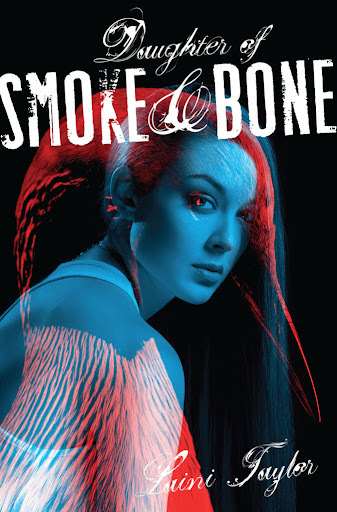 My interest in reading Laini Taylor’s Young Adult fantasy Daughter of Smoke and Bone began while I was leisurely perusing a copy of my Entertainment Weekly. The magazine’s A- review said of the book: “The smartly plotted, surprising, and fiercely compelling read will hook you from its opening pages.” Wow, I thought to myself, I want to be hooked! Reviews on Amazon and Goodreads were equally passionate. This is basically Romeo and Juliet with angels and demons. Basically. But the world Taylor creates around this pair of star-crossed lovers is intriguing, and she does a good job of exploring the deeper emotional aspects of loyalty to one’s kin and the yearning to understand something outside of oneself. I felt the main characters were fully drawn, and appreciated their individual quirks and curiosities. The mysterious Karou was by far my favorite, her emotions and motives felt richer than any of the other characters, and it seemed Taylor spent the most amount of time revealing Karou’s layers for the reader. Akiva, however, felt a bit more stiff to me – square and stoic. Though I suppose Taylor tries to explain this by expounding on the loveless upbringing and tragic losses of his past. I also felt great affection for Brimstone and the others who raise Karou in their non-traditional, monstrous den, and also for Zusana, Karou’s puppeteer best friend. The earthly locations in the story were well-chosen – Prague and Marrakesh both gave an exotic feel to the story. The “other-worldly” locations in the book were not as realized for me, but I’m guessing we spend more time there in the 2nd book. The story itself was dramatic and romantic, kind of a sweeping saga, really, of identity and war and love. At times the angel/demon mythology of it all got in the way of the story for me, and I found myself swatting certain confusions away in an effort to just remain fixed on the characters themselves. The content – in terms of language, violence, and sexual matters (which I am always conscious of, especially in this case with my teens waiting to read it next) – was acceptable, with just a few moments I would think to fast forward if it were a movie (although these scenes are described in a non-specific sweep of words). I had two main issues with the book. The first was that I felt the connections between the intertwining stories of angel, devil, and human, and this world and “Elsewhere,” were a bit jarring at times. It was not as seamless as I wanted. Instead of feeling suspense, I felt disoriented, and there was a point at which I left the book sitting for a few days, not sure if I cared to finish it. My second issue was that I felt the author waited maybe one or two beats too long before answering all the questions she painstakingly sets up in the first third of the book. I was *ultimately* satisfied with the resolution of many things, but it was more like a flood of information at the end, instead of a more steady, rewarding pace throughout. I may actually have a third issue with this book – because I admit, I’m a snob about these things: I hate the cover (as seen above). But not as much as the other cover I’ve seen. There is one cover that might do the story justice, but I’m not sure where it’s being sold or if it’s in wide production. It just breaks my heart when a pretty good book is housed in a kind of lame cover. Just look at the book’s website to see how cool the cover ought to have been. All-in-all, I was pleased with this book, and found it inventive, well-written, and memorable. If forced to give it a grade, I’d say…maybe a B. With a B- for some of the parts I wanted to get going already. The second book of this proposed trilogy is set to come out in Fall 2012. If you’d like to check out Daughter of Smoke and Bone for yourself, the first five chapters are available online. *Disclosure: Although I am often sent books by publishers for review, I bought this myself and reviewed it of my own free will. Well…I review everything of my own free will, but you know what I mean. This entry was posted in Book Reviews, Young Adult Fiction and tagged book review, Fantasy, Laini Taylor, Reading.